The balmy climate and the metropolitan culture of this southern Indian city was first home to high technology public sector companies. This ensured that Bangalore was the natural home of high technology research and development in India with almost all the major corporations having a strong presence. Capital of the Southern state of Karnataka, Bangalore is Asia's fastest growing cosmopolitan city. It is home to some of the most high tech industries in India. The I.T industry views Bangalore as the 'byte-basket' of India. Bangalore is also home to some of India's premier scientific establishments. Blessed with a salubrious climate, gardens & parks, natural lakes, architectural landmarks, shopping malls, the best restaurants and pubs in this part of the globe, business opportunities, Bangalore is the ideal gateway to India and beyond. Bangalore offers something for everyone-music and dance concerts (Western and Indian), dramas, exhibitions, carnivals, conferences and more. The Bangalore Fort was built by Kempe Gowda and expanded by Tippu Sultan. Within its walls is the well preserved 16th century Ganapathi Temple. 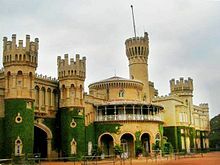 The Bangalore Palace was built by a Wodeyar king in 1887 on the 400 acre space. Inspired by the Windsor castle, this palace was built in the Tudor style, complete with windows, foiled windows, battlements and turrets resembling the Daria Daulat Palace in Srirangapatanam, this summer palace has been constructed largely of wood and is famous for its carving and paintings. In June 2005 Srikantadatta Narasimharaja Wodeyar decided to open the palace to the public to meet its Rs 20 lakh annual upkeep costs. The special attraction is a gallery of nearly a thousand historical photos, including those of viceroys, maharajas and other famous personalities inside and exquisite carvings and paintings. One of the important buildings, the Government Museum is one of the oldest in India(1886). One of the important buildings, the Government Museum is one of the oldest in India(1886). A special attraction here are the antiquities from Mohenjodaro period. Situated nearby the museum is Visveswaraya Industrial and Technological Museum named after the great engineer-statesman . Next to the VITM is the Visveswaraya Industrial Trade Center, the first of its kind in India. In addition to its trade promotional activities, the Center has two exhibition floors housing a permanent display of all that is manufactured in Karnataka. This splendid neo-Dravidian granite building that dominates the northern boundary of the Cubbon park, is the home of the State Legislature and the Secretariat. The massive sandalwood door of the Cabinet room is a spectacular feature of this imposing building. The Vidhana Soudha is bedecked in illuminated glory during special periods and is a sight worth viewing. The building is open for visitors only after 3 PM. Hesaragatta is an interesting picnic spot offering water sports to the adventurous. Boating and wind-surfing is the major attraction. It also has a dairy & horticulture farm where you can picnic. Other attractions are Tipu's Drop, Yoga Nandishvara Temple, a beautiful Chola temple, Dravidian-style Bhoganandishvara temple and Muddenahalli, hometown of Sir M. Visvesvaraya, architect of modern Karnataka at the base of the hill. In March 2005 the Toursim department decided to make Nandi Hills a popular destination by introducing a 5-star hotel, ropeway and para-sailing facility. Bangalore is well connected by air, rail and road to all the major cities such as Delhi, Madras, Bombay, Calcutta and to most other important cities and towns. There are regular train services from Madras(4 trains per day), Mysore(7 trains per day), Calcutta(weekly twice), New Delhi(1 service daily). Bangalore Airport is used for both domestic and international flights. Please visit for details on Airtel Calling card. These calling cards are available at all Airtel outlets in Bangalore city. Brigade Road: Curzon Complex, St.Patricks Complex,Mota Chambers & 5th Avenue. Given below is a list of some moneychangers in Bangalore. 7 days a week. Timings: 0930-1930 hrs.